Toddler Sleep Problem: My toddler won't sleep without holding my hand. Toddler Sleep Problems: My 20 Month Old Wants Me To Hold Her Hand to Sleep! Would you like to have me answer your toddler sleep problem in my next video? If so, scroll down and submit your question in the comment section below. I will pick several questions a month to answer and post them here on the blog! Hi. Kim West, the Sleep Lady. And today, I’m going to answer Taylor’s question. She wrote in, “We have a 20-month-old girl, who has been waking one to two times a night, for the past three weeks. Initially, it began while we were away visiting family for nine days [not uncommon] and we all slept in the same room. She was in a pack and play. She got used to waking at night, and then of course ended up in our bed. Upon returning home, she was adamant about continuing this pattern and began jumping out of her crib. We then moved her into the toddler bed version of her crib. She does not come into the bed with us, but instead we go to her when she wakes. However, the issue is, that she requires hand holding in order to fall back to sleep. Taylor, I’m really glad that you wrote in. This is actually a very common question and there’s two important points I’d like to talk about. First, it is very common that when we go away on vacation, we ‘back slide,’ usually for excellent reasons, such as trying to not wake up in-laws or friends. Then when we get home, our child of course doesn’t understand why we’re not going back to the co-sleeping, the nursing, or whatever it is that we regressed to while on vacation, that we weren’t doing before the vacation. So, that part is very typical. Once you go to address the problem when you get home, the intensity of the crying tends to be worse, which usually is upsetting to us as parents, so we rush in to go ‘fix’ the problem, and further reinforce the sleep crutch. It’s not impossible to undo this, it will just take a little time and consistency on your part. The one challenging part that I do want you to think about is that you have transitioned your daughter into a bed at a very early age. At 20 months of age, she more than likely does not have the impulse control and the cognitive ability to understand “stay in her bed all night long”. By the way, the average age that a child understands that is two and a half years old. I have meet some two-year-olds, who seem to ‘get it,’ but I haven’t met many 20-month-olds who have. It may be that you are asking her to do and understand something that she’s not developmentally ready to do. This may mean turning the toddler bed back into a crib. You may want to try putting a sleep sack on her, so she can’t lift her leg up over the railing, or get a crib tent. Make sure you install it safely, and then move to the Sleep Lady Shuffle. Of course, if you get a crib tent, you immediately will not be able to hold her hand. You may want to do some work with her before then. I know it will take a couple of days to get the crib tent and turn the toddler bed back into the crib. If you are adamant about keeping her in the toddler bed, know that it could take weeks and I can’t guarantee success. You will probably be at your wits end by two weeks, but keep going! I have had successful cases at this age- but it’s not the majority. What you probably will have to do is sit in a chair, and say, “We’ll hand hold for two minutes, and then we’re all done, and mommy is going to sit here until you are asleep.” When she comes over to try to get up on your lap, stand up, and you say “lay down and mommy will stay with you until you go to sleep.” Repeat this as often as necessary until she lies down and goes to sleep. Stay until she is completely asleep. Make sure you safety proof her room! Again, I can’t guarantee that she is going to understand that. Either way you may have to go through some crying and possibly hysterics to resolve this toddler sleep problem. Know that you can hold her and hug her to calm her down, just don’t hold her to sleep. I would urge you to get the crib back out and to do The Shuffle. Start with two minutes of hand holding, put her into the crib, tell her, “I love you” and go through all The Shuffle rules outlined in my book. If you have successfully had a child transition to toddler bed, or done The Shuffle, please encourage Taylor! Please feel free to click the “reply” link under this article and leave them a comment. Supporting each other makes parenting so much easier! Hi Taylor! I can’t tell you the number of times I thought to write in with exactly the same question but was too exhausted or too busy to follow through on it. My 2 1/2 year-old was doing exactly the same thing, I think from the time he was two or at least 26 months. He is still in our bedroom (in a crib) so it was ten times easier for me to turn upside in bed and hold his hand through the bars of his crib than to ‘train’ him, but I was afraid there would be many tears and that it would take a while, so I put if off. Finally I needed my evenings back so I did almost exactly as Kim has described, telling him I would hold his hand for a little while and then I had to go, and I would stay right outside the door (and would tell him I’ll be right outside the door), and if he asked for me, I would say I’m right here, and I’m going to come back and check on you in five minutes, and he would actually just fall asleep. I think there might have been a few tears on one or two occasions but it was nothing compared to what I was expecting. When he did cry I would go back in and stroke him and tell him I’m right outside again. And voila, he doesn’t need to hold my hand to get to sleep and doesn’t wake in the night asking for mommy’s hand. I hope this helps. My son is a little bit older but I believe if you explain clearly and do it with love they ‘get’ it. Good luck! Anniebear that sounds frustrating. 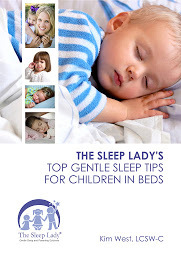 Your daughter may be experiencing the http://www.sleeplady.com/baby-sleep-problems/sleep-regression-just-a-phase/. Is is possible that she is teething? I would recommend that you post your question on http://www.facebook.com/thesleeplady for one of our trained Sleep Coaches to answer, too. Good luck!